They made a pledge to ideals that should befit every Santa Claus, closing that this pledge was made as a descendant of Saint Nicholas of Myra/Bari. These men have dedicated their lives to uphold the character of a man that truly very little is known about, yet his life has touched the world in a special way. Who was he? Why was he special? How does this one figure remain alive after 1700 years after his natural life has ended? Who is Saint Nicholas? If you would see him you would never think of the jolly, plump Santa that we all know and love. In contrast, Nicholas was a rather tall and slender man. 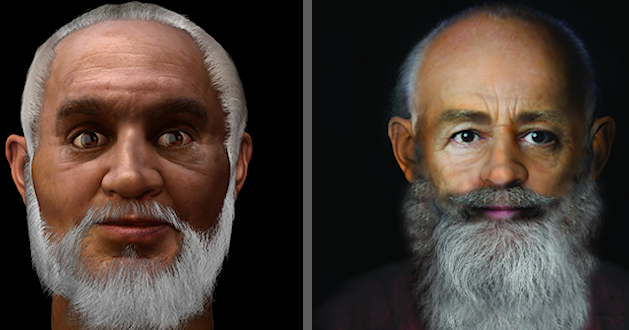 His beard was more likely cut in the fashion of the times, being cropped close to the jawbone. This is much different than the long, flowing beard of our Santa. A study performed on the remains of Nicholas in the 1950s by Luigi Martino, the University of Bari, described a man who had a bent back, worn shoulders, and a broken nose. The study also revealed that the Saint had lived on mainly a meatless diet. Nicholas would have been dressed in the clerical vestments of the day, carrying a long shepherd’s staff (crosier). Indeed the picture of Saint Nicholas is far different from that of our beloved Santa. However, the two share the common bond that became the seed of the Santa Legacy – a deeply rooted love and generosity to children of all ages. What was Saint Nicholas’ Early Life Like? Imagine the small Mediterranean village of Patara, in modern Turkey, between the years of 260-280AD. This was the hometown of Nicholas, who was born to Theophanes and Nonna. By accounts Theophanes was a prosperous merchant, and both he and his wife were very active in the Christian community. They had spent much time in prayer asking for a son. Then came Nicholas (which means the people’s victor) as an answer to that prayer. The stories about him begin at this point. One account says that the baby was standing on his own and talking at the instance of his birth. As Nicholas grew into his early teens we see the picture of a devout young man who fasted every Wednesday and Friday – a practice he continued all his life. It was said of Nicholas that he excelled in his knowledge of the Holy Scriptures and in the daily virtues of the Christian life. He especially held to a strict code of chaste thinking, abstinence, and temperance. He was also said to spend long hours in prayer to his Heavenly Father, sometimes for an entire day and night. This raised the attention of his uncle, who some accounts say was the bishop of Patara at the time. His name was Nicholas as well, and he realized that his nephew had a true calling for the service of God. As time went on and the old bishop decided to go on a pilgrimage to the Holy Lands, he left the care of the congregation to Nicholas. It was said that the future saint took the work very seriously, spending much time in fervent prayer and fasting. His care for the congregation was every bit as strong as that of his uncle. Also around this time came a great tragedy to not only Patara but also to Nicholas. A plague had swept through the town leaving no family untouched. Nicholas was left an orphan. However, Theophanes and Nonna had left a considerable inheritance to their son. Some of the priests admonished Nicholas that he should give it to the Church. But Nicholas had other ideas. He would use it to bless the needy. In his late teens to twenty in age, Nicholas was making his first steps to what he would forever be remembered for – a selfless giver to all. What Are Some Early Stories About Saint Nicholas? One of the earliest stories regarding his generosity actually took place when he was very young. A man in the village was unable to supply dowries for his daughters and was about to sell them out as slaves or prostitutes, as he was unable to give them a future. 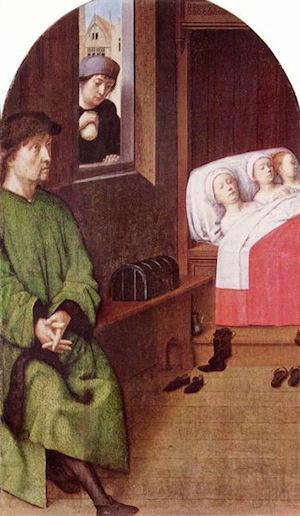 When Nicholas heard of the need of this very poor father, he came at night when the family was asleep and dropped a bag of gold either through the window or the chimney. Some accounts have this bag of gold actually falling into a stocking. Nevertheless, when the family awoke the next morning they were amazed and happy to find this gift. The father wept and thanked God. When it came time to marry off the man’s second daughter, Nicholas did the same thing. He secretly left another bag of gold in the night, which was received the next morning with great happiness and thanksgiving. Finally, when it came time to marry off the third daughter her father decided to find out who their benefactor was. So, Nicholas came once again in the night and left the bag of gold. This time the father chased Nicholas down and found out the identity of his benefactor. Nicholas made him swear that he would never tell the truth. Do you think that the poor man kept this promise? How Did Nicholas Become a Bishop And What About His Early Miracles? At one point in Nicholas’ early life he went to Alexandria and the Holy Land to study. Upon the return home, the ship that carried Nicholas entered a mighty storm. The ship was tossed, causing a man to fall from the mast to the deck of the ship. He was pronounced dead. Legend has it that Nicholas, in the name of Jesus Christ, calmed the seas and then went to kneel beside the fallen sailor. 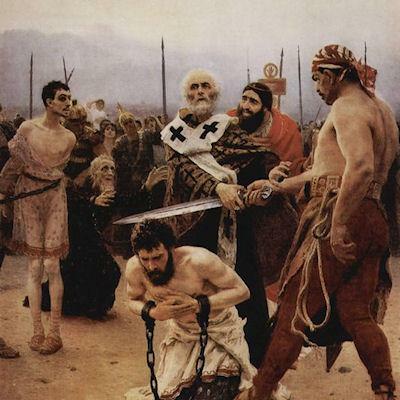 After a prayer Nicholas told the man to, “Raise in the name of Christ our Lord.” This the man did, and it was this act that caused Nicholas to be revered by seamen unto this day. Upon his return to Myra, Nicholas happened to just walk into the Church and be pronounced the new bishop. Here is how he received this station. While in sleep the night before, one of the priests had a vision from Heaven that the first man to enter the Church the next morning would become the new bishop. To prove this fact the man would be named Nicholas. Having no knowledge of this Nicholas entered for prayer early in the morning. When the priests asked his name, they fell to their knees in thanksgiving. Nicholas was in his early twenties at this time. Bishop Nicholas took his duties very seriously, and brought much good to his flock. It is said that he loved all, especially children and those who were in need or afflicted. He was constant in prayer and led his congregation wholly in the faith. Was Saint Nicholas Ever In Prison? Sadly, Bishop Nicholas lived in a time when the Christian faith was not approved. The Romans did all they could to squelch this new faith and not only caused problems for but also killed many Christians. The Emperor, Diocletian, was the Roman ruler at that time and called for an empire wide persecution of all Christians. Though many died, many others (including Nicholas) were beaten and taken to prison. What happened to him while there we do not know, but one thing is known – Nicholas raised above all the pain that he had to endure and remained forgiving and friendly to his tormentors. 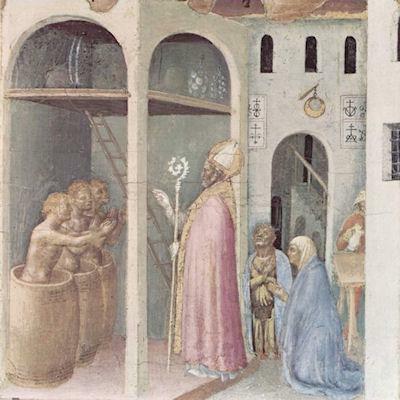 Legend has it that while in prison, Bishop Nicholas would make small toys for the children of his guards. This in turn caused some favor with them. Even in the strongest of persecutions, our Nicholas stayed the course for Christ, and with the coming of Emperor Constantine was released after four long years of imprisonment. His back a little more crooked, Nicholas returned to his Church in Myra to much rejoicing from the people. What Were Some of Saint Nicholas’ Biggest Achievements for the Church? By far there are two major acts that Bishop Nicholas performed which must be considered his greatest contribution to the Christian faith besides just his noble character. In fact, both took place not too far away from his home in Myra. You see, during this part of history there was still the influence of idolatry among the people. Too, Christianity was still in its formative years and there were still conflicts to be fought. Not far away in the town of Ephesus there was an altar to the goddess Diana. Nicholas launched a religious crusade to destroy paganism. In so doing Nicholas won many converts to Christ. One account tells of how Nicholas called the false spirits out of the actual shrine and claimed it for Christ. Truly this act of faith should not be forgotten. Another great event took place in 325 AD in the town of Nicea. An ecumenical conclave was held be Emperor Constantine, as the teachings of Arius were to be debated. Was Christ truly divine? That was the question raised by this teaching, which held that Jesus was but a mere man. Upon hearing this, Nicholas went to Arius and struck him in the face. Arius and his supporters appealed to the Emperor that Nicholas be removed from the proceedings. He was jailed. Stripped of his position, many of the bishops and Constantine dreamed that night of Nicholas and were told to release him and restore his position as he was indeed working for the will of God. Legend has it that an angel came down to Nicholas in his cell and delivered a special book to his hands. One account says that it was a book of the Gospels while others contend it was the Book of Life. Nevertheless, Emperor Constantine released Nicholas and restored him to his place in the conclave. It was said of Nicholas by John the Monk, “He was animated like the prophet Elias with zeal from God, putting Arius at the council to shame not only by word but by deed.” In the end, the teachings of Arius were condemned and a new creed was established within Christianity proclaiming the true and full divinity of Christ. Of the 318 leaders that were at this conclave, Nicholas had proven to be the most zealous for the cause. After this Christian triumph he returned to Myra and cared diligently for his flock. Are Their Any More Stories Regarding Saint Nicholas? The stories concerning Nicholas are too numerous to fully write down. Many have become legend. However, there are three that must be remembered which took place during his life. It is said that upon his way to Nicea that Nicholas stopped at an inn for the night. Though the land was in drought and famine, Nicholas was treated to a dinner of roasted meat. This intrigued Nicholas and he went into the kitchen to inquire of the Innkeeper of where this meat had come. As he entered he found that the Innkeeper had actually kidnapped, killed, and dismembered three young children and had placed them in three barrels of brine. It was the thigh of one of these that he had served Nicholas. Nicholas rebuked the Innkeeper and stressed that he should repent before God. He then turned to the barrels and prayed for the children to be made whole through Christ. The three children came out of the water whole and unharmed. The Innkeeper repented and asked for forgiveness. Nicholas forgave him and called for God to do the same. In another instance, three soldiers had been condemned for a crime that they had not committed. In fact the three had been on the road with Bishop Nicholas at the time. The sentence was death, and when Nicholas heard the news there was little time for a formal pardon from the Emperor. So, off he went to their rescue. He found them on the field of execution with the blade of the headsman raised high above the first soldier’s head. Nicholas ran to the man and stopped the sword between his own hands. Unscathed, he proceeded to tell the officials of his presence with the soldiers at the time of the crime. The three were released. Famine was a reality in the area around Myra. So many stories deal with Bishop Nicholas feeding the hungry. One such legend finds Nicholas doing just that. The people were starving and they called upon the good bishop to help them. Far out on the sea was a ship filled with grain. As the captain slept he began to dream. In his dream he envisioned Nicholas beckoning him to come to Myra where he could sell his grain. This the good captain did and upon the morrow the town was saved from hunger. The captain also received the price he was asking. Some stories tell that when the captain returned to the ship it was miraculously filled with grain once again. When Did Saint Nicholas Die and Where Are His Remains? Nicholas continued doing great works for Christ until he was advanced in years. He had devoted his life to the ministry of Christ, and on December 6, 343, was called home to be with his Lord. His last words came from Psalm 11, “In the Lord I put my trust.” He was laid to rest in great honor within the small cathedral in Myra where he had served so long. He was buried there by much monastic pomp and by a countless crowd of mourners. All grieved for this beloved leader. He remained within his tomb there for nearly seven centuries, until a group of sailors from Bari, Italy, took the remains and carried them back home with them in the 1070s. There are many stories as to why they did this, but it appears that the most plausible was to protect the remains of Nicholas from the raiding Muslims who had just before destroyed many of the Christian sites of the area. He now lays within the Basilica di San Nicola di Bari in Italy. Upon opening the tomb the nostrils of the thieves were met by a very sweet and wonderful fragrance. It was discovered that myrrh, one of the gifts given to Christ at His birth, actually exuded from the remains of Nicholas. This myrrh, called “manna” is said to have many healing properties. Every May there is a festival in Nicholas’ honor. 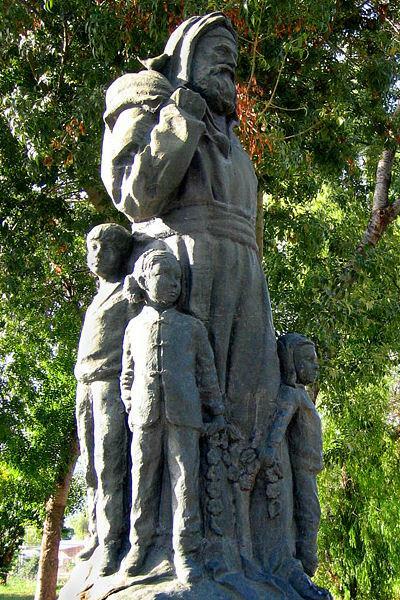 His feast day is honored as well, with the tradition reaching all over the world. Miraculous stories of Nicholas still are carried and his tradition and teachings are well remembered. When Did Nicholas Become a Saint? We really have no date to an official canonization of Saint Nicholas. The official canonization process would not be in effect until the 1000s. But, it is believed that he was called Saint Nicholas as early as the 500s when Justinian I built a church in his honor. Accounts from as far back as the 800s tell of him as Saint Nicholas as well. We definitely have proof that by 1100 he was perhaps the most beloved and powerful of the Saints. More churches and more monasteries were named for Saint Nicholas than for anyone else other than the Holy Family. Knowing this, it was a group of French Nuns that are said to have been the first to begin the practice of giving gifts on December 5, the night before the Saint Nicholas Feast in his name and honor. Each was done in secret, as was the method of the Saint. From this point on the legend of Saint Nicholas grew and expanded from Turkey to cover the entire world. Vincent A Yzermans wrote, “The evolution of Saint Nicholas to Santa Claus, embodying goodness and love, good cheer and virtue, heartiness and holiness was really not a hard one.” Stories of his generosity and especially his kindness for children, intermixing with various regional influences, have created the modern Santa Claus. As Santa Claus, we have a wonderful line of heritage that truly began in many ways with this man, the Wonder worker of Myra. As we all strive to be the best Clauses that we can be, let us never forget Saint Nicholas, his life, teachings, and example to all who believe in the wonders of childhood. Santa John Johnson © 2009 - All rights reserved.